Poster by Tami Twarog, at the Inaugural Tweet-Up of The Emperor’s Bridge Campaign, held at Emperor Norton’s Boozeland, San Francisco, 28 September 2013. Forty subjects of the Emperor Norton walked into a bar. That was September 2013. Over the course of six weeks, John Lumea’s Change dot org petition calling on the California state legislature to name the San Francisco-Oakland Bay Bridge after Emperor Norton — launched in early August — had sparked a Twitter-fueled mini-movement, resulting in 4,000 signatures and loads of local and state media coverage. Alas, it wasn’t enough to get state lawmakers to do the right thing — at least, not in 2013. And, yet: The effort had galvanized an awful lot of goodwill and good energy around the Emperor. And — most important — we are still here! 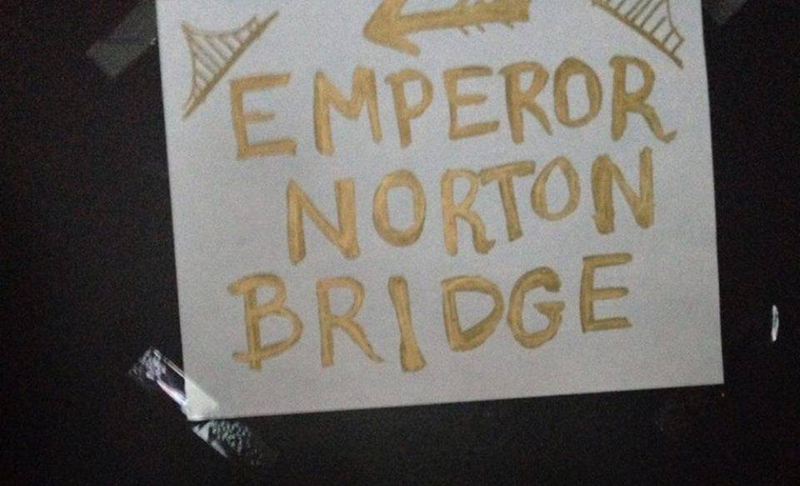 Please join us, in this year of Emperor Norton’s 200th birthday, as we return to the scene of the crime — exactly five years after our first gathering — to toast the Campaign and the Emperor! And bring all of your Emperor-saluting friends! Friday 28 September 2018 from 7 to 9 p.m.
One dollar off all drinks made with Raff spirits!